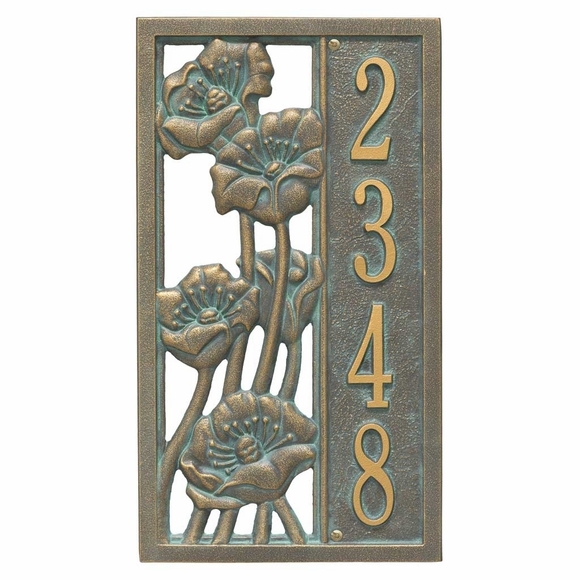 Vertical Address Plaque with Flowers - - the elegant poppy silhouette allows the wall to show through and adds a new level of curb appeal to this artistic house number sign. Vertical orientation. Made in USA. Wall mount. 15.6"H x 8.75"W. Holds up to five (5) 3" numbers. Seven colors: AB antique brass, AC antique copper, BG black/gold, BV bronze verdigris, OG bronze/gold, PS pewter/silver. Large image shown in bronze verdigris. Smaller images (from left to right): antique brass, antique copper, black/gold, bronze verdigris, oil rubbed bronze, bronze/gold, pewter/silver. Dimensions: 15.6"H x 8.75"W x 0.375. Decorative flowering poppies address sign doubles as an original piece of outdoor wall art.